Sports clubs and federations are embracing new technology and platforms to engage fans, but issues around rights and connectivity are preventing the experience from becoming truly joined up according to an expert panel at ISE 2018’s Sports Venue and Fan Engagement Summit. In the session, titled Even Closer to the Action, vendors, streamers, and digital content firms had clear visions of what the future of fan engagement should involve. For Nik Selman, managing director of digital content agency Formidable, creating an authentic experience for Millennial fans requires a different approach than one used with previous generations. “They [Millennials] are hugely passionate about football, but they want to interact with the game in a different way,” he said. “Authenticity to them means right now—it is very much about providing them with content that feels behind-the-scenes and personal, it’s less polished viewing that you can’t see in stadium or on TV at home,” he added. Other members of the panel observed that one underexploited area was engaging in football clubs’ global fan bases to craft authentic content for those fans and then generate new revenue streams. 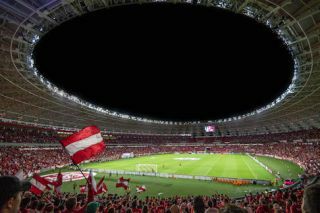 David Patton, VPP of Suppnor, an augmented reality (AR) technology company focused on sports, added that once this fan data is analyzed, it would allow advertising platforms to produce more relevant commercial opportunities. “If we, as a platform, can enable a club as to how they can message fans in different countries, then we can create new and relevant in stream advertising,” he said. But what about the future? Besides hopping in a time machine, the other option for figuring out what fans will want and need is data collection. But, a lack of connectivity is currently a hindrance for data mining in sports. According to Ryan Jespersen, regional EMEA manager of live streaming company Wowza, “trying to scale IP-based unicast delivery” was a challenge, as mobile devices are currently unable to consume multicast content. His firm is currently working with Cisco to design access points across the stadiums to access fan intelligence. He added that for some games, using public internet access was also not an option because of rights issues.